Summer positions fall into several categories. Click on the colored text/tab below to see what positions are listed in each of these categories: 1) workshop (teaching), 2) administrative & program design, 3) counseling, 4) support services (health care/safety, facility support), and 5) food service. (Interns typically fit into # 2, #4 or #5.) After reviewing position options and hiring criteria, please visit the staff application page. 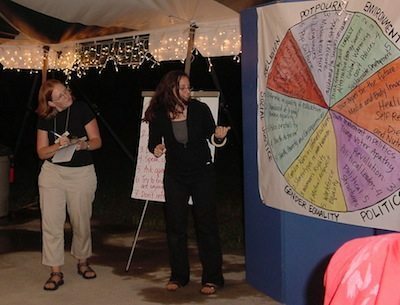 Global Youth Village cabin counselors are diverse in culture and youth work experience. Each cabin is staffed with one counselor and is home to 7-10 participants. Cabin life serves as an important foundation to the Village experience by creating an accepting and secure environment. The counseling team works closely together to promote sensitivity to all cultures, encourage personal development and integration, and ensure safety. Counselors are role models of participation, cooperation, care, and respect and are responsible for guiding youth through their GYV experience of self discovery; contributing to a deeper understanding of one’s self and how personal actions affect the world around them. Inspired? Please review the counselor job description. GYV’s home-style meals are delicious! Our professional food service staff provide three healthy meals daily to approximately 80-100 people, featuring varied vegetarian menus with international flares. We strive to provide unprocessed, locally grown produce and fruits, whole grains, beans, and dairy products, accented by produce and fresh herbs from our organic gardens. International entrees are prepared from countries such as Greece, the Middle East, India, Indonesia, and Africa, as well as traditional American “comfort food”! Special diets can be accommodated, and GYV can readily offer vegan and gluten-free options. Health Care Positions are open for either a licensed RN, LPN or a lay person with a minimum of first aid / CPR certification and some experience in a health care role. (Student nurses or recent graduates are welcome to apply.) Duties vary according to level of experience and license. Work may include: health screenings, providing 1st aid at all-Village events, caring for ill staff or participants, escorting people to the local physician’s office, stocking 1st aid kits, administering routine medications. Applicants must be 21 or older, with a valid U.S. or Canadian driver’s license. Current 1staid and CPR certification is also required. Facility & Program Support: Prepare, clean and set-up general program areas, including daily cleaning in bathhouses. Help set-up for evening programs and special events (moving props, decorating, stage or sports events set up). Prefer if candidate is a licensed driver (U.S. or Canadian). Must be self-motivated, able to work effectively with minimal supervision, tolerant of summer heat (and bugs), and organized! (Applicants who are high school graduates and at least 19 years old will be considered). For details, please review the job description. To apply, complete the Program Application. If you are not interested in a full time summer internship, check out this link for other options. Offering an activity or monitoring a cabin area during daily free time period.